Astronomy Israel: How Dark Are My Skies? We are participating in the Globe at Night citizen-science project going on now through March 6. This is a project to estimate the amount of light pollution world-wide by comparing star maps of the constellation Orion with what is visible in the local night sky. 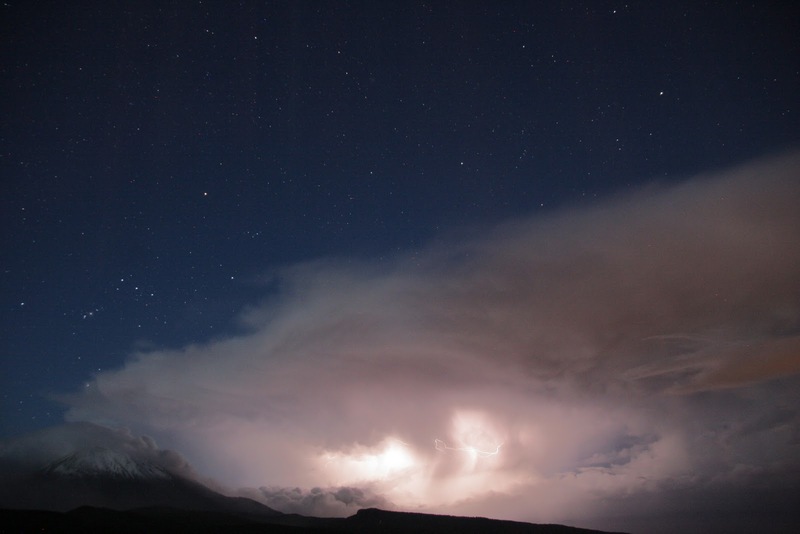 Light pollution is not only bad for star lovers, but it also has a deleterious effect on wild life, and has recently been found to increase the incidence of caner. We have posted five magnitude estimates for the darkness of the skies in Israel: One from the beach in Ashdod and four from Mitzpe Ramon. 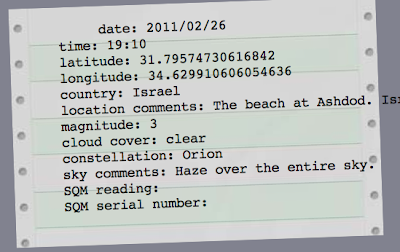 We were in Ashdod for Shabbat, and as we left on Saturday night, we made a stop in the parking lot by the beach so I could do a magnitude estimate on the constellation Orion. There had been a dust storm Friday and heavy winds on Shabbat whipping up white caps and large breakers on the beech. By Saturday night the wind had abated, but the sky was quite hazy over the Mediterranean, so I don't think my estimate of a limiting magnitude of 3 was accurate for the area. It is probably at least limiting magnitude 4 by the beach, although Ashdod, as Israel's 4th largest city, has plenty of light pollution. My next darkness estimate was at my regular observing location above Mitzpe Ramon. Here I judged the limiting magnitude as 6, generally considered the naked eye limit, although the comparison sky charts provided by the Globe at Night go down to magnitude 7. This is a very dark location, despite its proximity to the town of Mitzpe Ramon. The magnitude limit is not even across the sky, since there is a light pollution dome from Mitzpe to the east, although some of it is blocked out by desert hills. Looking out south and west, as well as at the zenith, the sky is quite dark, probably Bortle Zone 2-3. Since I do almost all of my observing from around Mitzpe Ramon, I wanted to plot the darkness/light pollution from a number of locations. So, my next stop was Har Gamal, a camel shaped promontory on the edge of town that overlooks the Machtesh. From here the bright lights of the town are visible, as well as some lights from a new area under development. Despite this, I was surprised to find that the skies were magnitude 5. I expected them to be much worse, perhaps eve magnitude 3. I think it is because the area around Mitzpe Ramon is so dark, that the lights from the city have as little effect as they do. I then journeyed over to the Visitor Center, now under reconstruction, which sits at the edge of town by Route 40 and the new Bereshit hotel. Light pollution is significant here, and I found, as I expected, that the limiting magnitude was about 4. To round out my mapping of the light pollution around Mitzpe Ramon I wanted to get a reading from within the town itself, so I chose an empty field across from the CafeNeto. It is surrounded at a distance by street lights, but none shine directly in the eye from nearby. Here was my biggest surprise, because the limiting magnitude here, as at the Visitor Center was 4, although there were many more lights surrounding me. I expected the limiting magnitude here to be 3 or even 2. I can only conclude that the small size of Mitzpe Ramon, fewer than 5,000 people, and the generally clear and very dark surrounding skies kept the sky darker than I expected. All in all, I believe Mitzpe Ramon continues to have some of the darkest skies in Israel. Finally, above is a remarkable photo of the constellation Orion and Auriga as seen from the Canary Islands after huge storms have passed through. At the bottom left is the Teide volcano whose flanks are covered with snow from the passing storm, while the entire scene is lit with cloud-to-cloud lightening.